An Interview with “Nice Things” Playwright Vince Melocchi | That Awesome Theatre Blog! Nice Things, a new play by local playwright Vince Melocchi is making its world premiere at the Rogue Machine on October 4th. Nice Things is the relevant and timely story of the economic hardship that so many American’s are facing. Facing fewer and fewer options for their futures, it is a story about the youth of small town American cities who are finding the only real option for them is the military. The Rogue Machine is an exciting and vibrant theatre that takes risks and always puts out excellent work, so it stands to reason that Nice Things was a perfect fit for such a company. 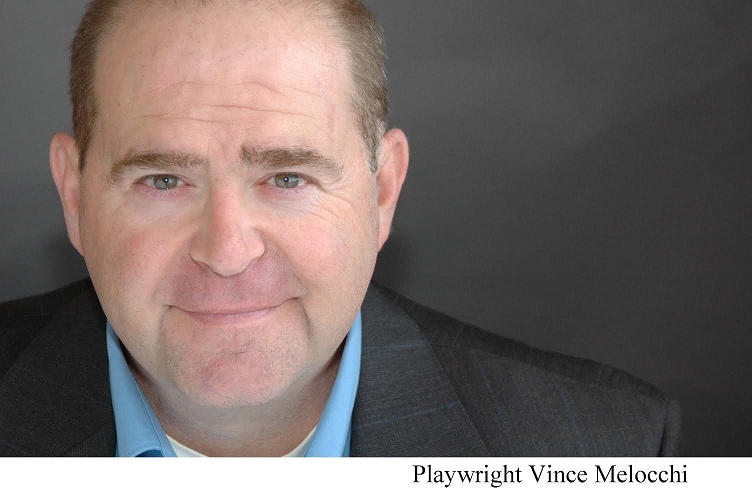 Playwright Vince Melocchi is from a small town in Western Pennsylvania, and has worked his way from being a janitor, to taking acting classes in community college, to respected and Ovation Award nominated playwright. his plays Lions and Julia were both produced at Pacific Resident Theatre to critical acclaim and sold out runs. But now it is at Rogue Machine, one of LAs best small theatres, that Melocchi finds his newest work set to premiere. As a writer/actor, and a voice in the burgeoning community of Los Angeles theatre, I recently interviewed Mr. Melocchi about his journey, process, and experiences as a storyteller. Patrick: What can you tell me about this new play? Specifically, is there something about the story that you felt just had to be told? Vince: I wrote Nice Things as a response to the lack of job opportunities in small, blue collar towns. The exception being those opportunities being offered by the armed services. I was intrigued by the desperation of the military to enlist recruits and the desperation of people looking for a decent life. Just the simple things, like the opportunity to pay bills on time, have food on the table and maybe…have some of those Nice Things we’ve been told are a part of the American dream. We have a whole bunch of people who have just been left behind and I wanted to start a discussion on that. Never mind the stress put upon military recruiters to sign kids. They are under extreme pressure and it’s not pretty. Patrick: Why playwriting? What is it about the specific medium that draws you? Vince: I love playwriting because it’s primarily dialogue driven. The key is making sure that the dialogue is active. If it’s just a couple people talking, it can get boring. And, nobody wants boring. Being in the theatre and hearing great actors speak the words you’ve written is an experience like none other. Patrick: What advice do you have for young or unknown playwrights, specifically local writers? Vince: The advice I’d give to young writers is pretty simple. Write about the world you are passionate about, and what you know. Read and see a lot of plays. Listen to people and what they are saying when they think no one is listening. The best stuff you’ll write is taken from conversations you hear every day. Patrick: Who are your biggest influences, and how do they affect your work? Patrick: How did you find the transition from actor to writer, and did your experience on stage make you a better writer? Vince: Being an actor has been incredibly helpful in making me become a better writer. Because I know what actors are going through while in rehearsal. I’ve been there. I know those highs and lows they are feeling, the frustrations and triumphs. And, by the time they are working on the script, I’ve acted out everything that I’ve written. It’s why I feel so deeply for all of my characters. I don’t think I could have that connection without being an actor. But that’s just me, a lot of great writers are just…writers. Patrick: What processes for writing do you find to be the most useful to you? Vince: I really start each play with something that I feel needs to be said. It usually starts with a thought or idea or image that moves me. For instance, Nice Things started because of an article I read about recruiters committing suicide because of the stress they endure. It’s changed, but that was the seed. I usually start dreaming and it digests for a while before I write. Then I’ll write scenes, flesh things out and once I’m ready I will bounce things off of people that I trust. Ask Elina de Santos and John Perrin Flynn (my director and dramaturg, respectively) how many drafts of Nice Things they’ve gotten. Endless. Patrick: What play do you wish you had written? Why? Vince: “Good People” by David Lindsay Abaire. The play speaks to me on many levels both personally and professionally. Good People tells a great story about the plight of todays working class without being preachy or heavy handed. The characters are real and richly drawn, with a complexity that is very tough to pull off. The structure is just terrific. There is no wasted dialogue in the play. Its simply a great piece of theatre. I directed Vince in my own play, Mickey’s Loft. Nice to hear this fine actor is now a fine playwright.